The owner of a Loch Ness Monster visitor centre has been charged with stealing a rival tourist attraction’s advertising sign. Donald Skinner, 70, of Nessieland Castle Monster Centre in Drumnadrochit, has been accused of taking the sign belonging to the neighbouring Loch Ness Centre – also dedicated to the loch’s famous monster – earlier this month. But he claims he did not steal the sign. He says he “took custody” of it because it was blocking a sign advertising his centre from being seen. I am not sure who the accuser was but this comes on the back of the recent war of words over how the locals should present the Loch Ness Monster to tourism. So what is next? Drive by shootings with Tommy Guns? Probably not, but someone needs to step in and end this before it grows legs. The Daily Record updates the situation by stating that the Nessieland owner, Donald Skinner, has been arrested over the incident. NESSIE wars have broken out in a Highland village – leading to a visitor centre owner’s arrest for theft. Donald Skinner, who runs Nessieland Castle in Drumnadrochit, admits taking a sign belonging to the rival Loch Ness Exhibition Centre. But he denies breaking the law and insists he “took custody” of it because it was blocking one of his own signs. Mr Skinner, 70, said yesterday: “I have an official sign opposite their place, saying, “Nessieland 300 yards ahead”. “They put another sign in front of it. I asked them to move it and this went on for three or four weeks. “So I warned them if they left their sign there, I would have to take it into custody. They didn’t move it so I took it. The Loch Ness Centre, which has been run by Robbie Bremner and his family for 30 years, declined to comment. The two businesses have a long-running history of disputes. Mr Bremner sued Mr Skinner three years ago, claiming he had lost £1.3million because his rival called his business The Original Loch Ness Exhibition Centre. The case was settled out of court after Mr Skinner agreed to change his centre’s name. There have also been previous disputes relating to signs pointing to the two attractions. 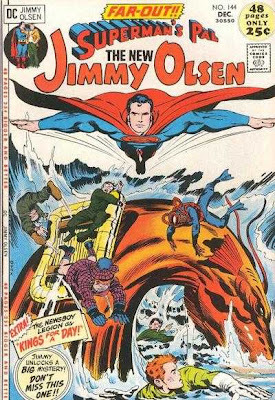 In recognition of the latest Superman blockbuster, "Man of Steel", it may interest readers to know that Nessie gets a mention in at least one Superman comic of old. 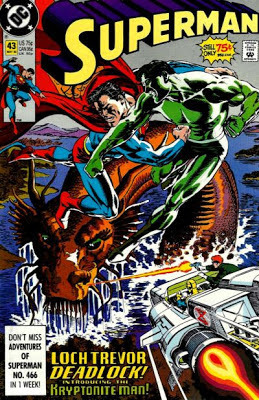 It is Action Comics No. 497 published in July 1979. Ever wondered how to get the definitive proof for the Loch Ness Monster? "This is a job for Superman!" Now if you read the speech bubbles, you may have noted that Superman mentions the Loch Ness Monster, but this is actually the Loch Trevor Monster he has bagged! What on earth is the Loch Trevor Monster and who ever thought of that ridiculous name for a Scottish loch? Indeed, does it outdo the outrageous "Hoots Mon!" Scotsmen in the comic for laughability? 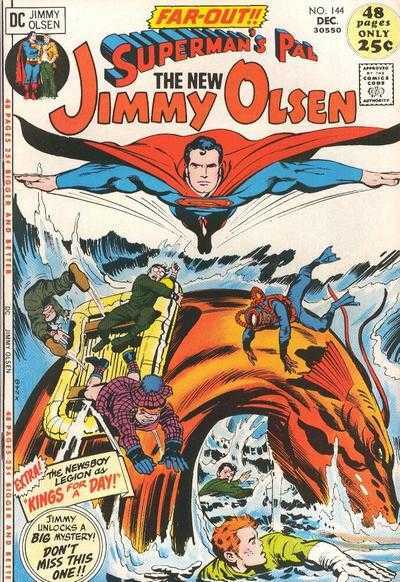 Well, it may have something to do with this earlier Jimmy Olsen comic drawn by the late, great Jack Kirby. 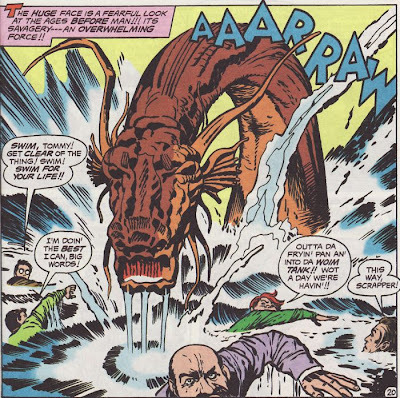 And last but not least DC Comics' resident "Nessie" also made this appearance in May 1990. Well, at least Superman informed us that Nessie is not the survivor of alien experiments. Just in case any of you guys were toying with that idea! BTW, I enjoyed "Man of Steel" and though it was better than "Superman Returns" but that original Christopher Reeves "Superman" film still wins it for me!